Following on from the "can I live in a garage" thread, how about this instead. "The Dovecote was beautifully converted some 10 years ago and offers a potential purchaser a fairly unique opportunity, ideal for a professional couple or indeed someone downsizing." Yours for £225,000, cheep if you ask me. 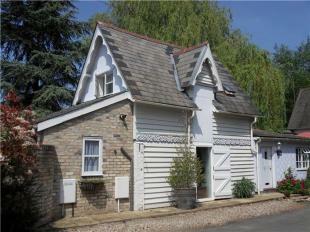 Wasnt that long ago you could buy a 4 bed detached place in Sawston for under £150k. Parents were looking there around 2000/01 IIRC. A pedant writes: How can anything be `fairly' unique? Looking at photos, does `downsizing' mean `shrinking' ? It seems about the going asking price around Cambridge nowadays. It's only under £250k because it's a bit too far out from Cambridge itself to cycle or commute easily. If it was under £200k it would be pushing into 1-bed territory and you can't have that now, can you? And I'm not an EA, I'm just resigned to the fact that this seems to be where the market is around here. Here's one at £8,000+ per sqmetre .....cheap as chips.....!! As soon as I read "some 10 years ago" I thought, the owners didn't convert it and don't know when it was converted but would like to get their money back. stop buying the stuff then. I'm not buying! I'm waiting for prices to fall but it's not happening around here yet. A few £5 or £10k drops but nothing significant. Maybe you could have a word with everyone else in the area and get them to stop buying. I'm not buying! I'm waiting for prices to fall ™ but it's not happening around here yet. A few £5 or £10k drops but nothing significant. Id like to. change the mentality a bit.